THE OLD ENGLISH ROAD HORSE Is a strong, vigorous, and active kind, capable of enduring great hardship ; its stature rather low, seldom exceeding fifteen hands ; the body round and compact, its limbs strong, and its head thick. Although this breed has of late years been neglected, and almost totally superseded by Horses of another kind, more nearly related to the Race-horse, where the fashion of figure seems to have been preferred to utility, we cannot help congratulating our associated countrymen [agricultural societies] on their spirited exertions towards public improvement, in which nothing of excellency in the various kinds of domestic animals is suffered to escape their vigilance, and this kind is again likely to be brought into notice. A mare of this breed, in the possession of Arthur Mow­bray, Esq. of Sherburn, appears to us to possess all the valuable properties attributed to the old Road-Horse. THE BLACK HORSE. No other country has produced a breed of Horses equal in size and strength to the larger kind of our draught Horses. The cavalry of England formerly consisted of this class of Horses; but their inutility being experienced in most situations, others of a lighter and more active kind have been generally substituted, except in a few re­giments. The fens of Lincolnshire produce a larger breed than any other part of the kingdom. 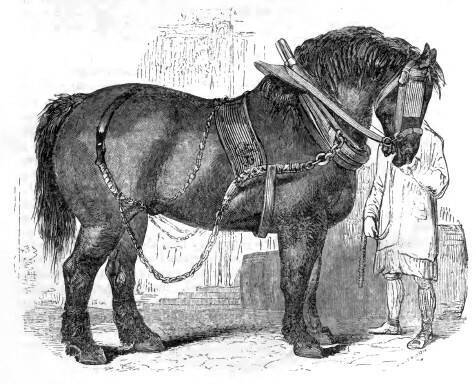 In London, there have been instances where a single Horse of that kind has drawn, for a small space, the enormous weight of three tons, half of which is known to be their ordinary draught. 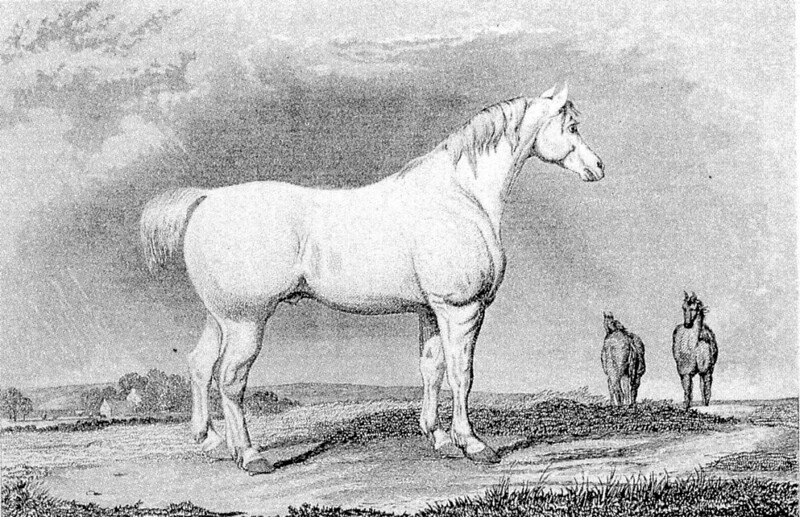 Considerable improvements have of late years been made in this kind of Horses, by Mr Bakewell of Dishley, and others; who, by great ingenuity and attention, have acquired such celebrity, that they frequently sell stalli­ons of their respective breeds for two hundred guineas; or, what is a more general practice, let them to hire by the season, for forty, eighty, or perhaps an hundred guineas; and some of them cover at five guineas a mare. 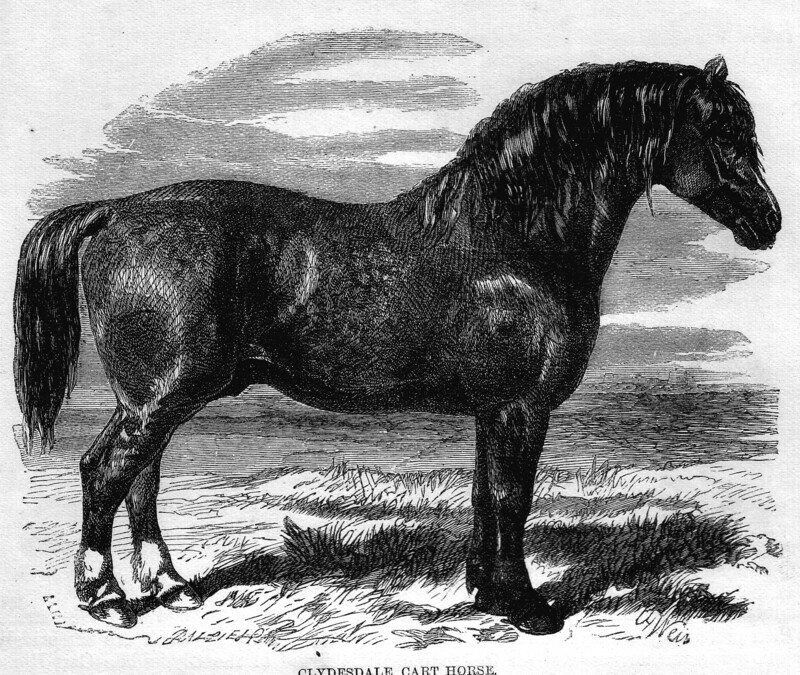 The form of the black Lincolnshire Horse has, by their management, been materially altered: the long fore-end, long back, and long thick hairy legs, have gradually con­tracted into a short thick carcase, a short but upright fore-end, and short clean legs; experience having at length proved, that strength and activity, rather than height and weight, are the more essential properties of farm Horses. Another advantage possessed by this improved breed, is its hardiness, or thriving quality; its being able to car­ry flesh, or stand hard work, with comparatively little provender. This hardiness of constitution, or natural propensity to thriving, the Leicestershire breeders assert is hereditary in particular individual breeds or lines of Horses. If this observation be just, and that the feeding quality can be obtained with any degree of certainty by management in breeding, in this as well as other kinds of live stock, it is a most interesting circumstance in the nature of domestic animals. A strong, bony, and active kind of Horses is now used in our carriages, instead of the old black Coach-Horse, which is almost universally laid aside. The docked tail, offensive both to humanity and decency, is rarely to be seen: propriety and good sense have at length prevailed over a custom replete with absurdity; and our Horses are permitted to retain a member both useful and orna­mental. But we have still to regret, that the cruel prac­tice of forming the tail, by cutting and nicking it on the under side, is yet continued. Although it would be impossible to trace out the kind of Horses with which our British ancestors opposed them­selves to the legions of Julius Caesar, on his landing in this country, yet that celebrated warrior himself bears testimony to their activity and discipline. THE COMMON CART-HORSE Is inferior to the Black Horse both in size and strength: his form is heavy, his motions slow, and his aspect with­out sprightliness: he is nevertheless extremely useful, and is employed in the business of agriculture and other domestic concerns. THE IMPROVED CART-HORSE. IT will be gratifying to most of our readers to know that the spirit of improvement has extended itself greatly to this useful breed; and to the advantages of strength and docility, has added those of form, activity, and vigour. George Baker, Esq. of Elemore, in the county of Durham, has a remarkably fine Horse of this kind, from which this figure was drawn. 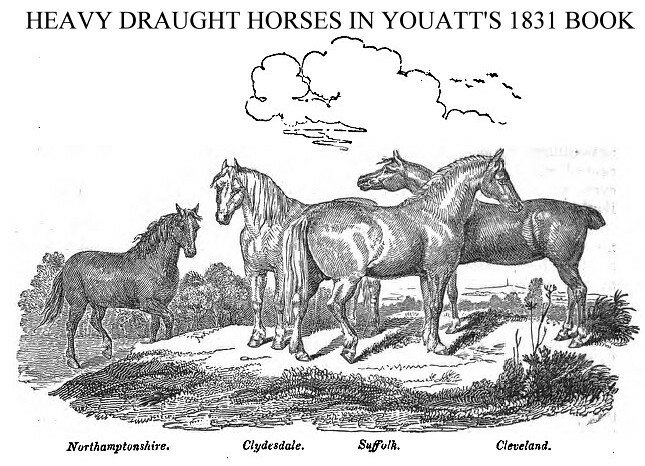 In 1843, Youatt described the three heavy horse breeds as being the Suffolk Punch, the Clydesdale and the Heavy Black Horse (which later became the Shire). In "The Complete Grazier And Farmer's And Cattle-Breeder's Assistant" (1864) Youatt lists the varieties of draught horses as the Cleveland Bay, the Suffolk Punch, the Clydesdale, and the Old English Black or Lincoln cart-horse and wrote "These are the principal breeds of farm-horses, properly so called, but there are in almost every county useful working animals of no definite race; there are also, unfortunately, mongrel breeds, whose only claim to be designated 'farm-horses' arises from their not being fitted for any other purpose: the perpetuation of these half-bred ill-formed animals tends greatly to depreciate the good old breeds with which they are too often mixed.". At the end of the 18th Century, the Suffolk Punch, the Clydesdale and the Heavy Black Horse were being improved by crossing to heavy horses imported from Flanders and the Low Countries (the Netherlands and Belgium) resulting in larger, stronger animals. Geldings were preferred for draught work and the habit of gelding the colts young (rather than waiting to see if any showed promise for breeding) resulted in stallions being in short supply. As a result, the stallions travelled around the country, something that would have helped standardise the conformation of the breed. In addition to the Suffolk, Shire and Clydesdale, there were lighter draught breeds such as the Irish Draught, Cleveland Bay and now extinct Devon Packhorse, Yorkshire Coach Horse and Vardy horse. At the end of the First World War, the Percheron was introduced from France while the Ardennes has arrived much later (heavy horse shows have Percheron classes, but not Ardennes classes). The Farmer's Horse. The Farmer’s Horse is an animal of all-work; to be ridden occasionally to market or for pleasure, but to be principally employed for draught. He should be higher than the road-horse: about fifteen hands and two inches may be taken as the best standard. A horse with a shoulder thicker, lower, and less slanting than would be chosen in a hackney, will better suit the collar; and collar-work will be chiefly required of him. A stout compact horse should be selected, yet not a heavy cloddy one. Some blood will be desirable, but the half-bred horse will generally best suit the farmer's purpose. He should have weight enough to throw into the collar, and sufficient activity to get over the ground. Farmers are now beginning to be aware of the superiority of the moderate-sized, strong, active horse over the bulkier, but slower animal of former days. It is not only in harvest, and when a frosty morning must be seized to cart manure, that this is perceived, but, in the every-day work of the farm, the saving of time, and the saving of provender too, will be very considerable in the course of a year. It has often been said, that a horse used much for draught is neither pleasant nor safe for the saddle. The little farmer does not want a shewy, complete hackney. He will be content if he is tolerably well carried; and (if he has taken a little care in the choice of his horse; has selected one with sound feet, shoulders not too thick, and legs not too much under him; and, if he keeps him in good condition, and does not scandalously overweight him,) the five days carting or harrow-work will not, to any material degree, unfit him for the saddle; especially if the rider bear in mind what we have termed the golden rule of horsemanship, always a little to feel the mouth of the animal he is upon. A farmer, and, more particularly, a small farmer, will prefer a mare to a gelding, both for riding and driving. She will not cost him so much at first; and he will get a great deal more work out of her. There can be no doubt that, taking bulk for bulk, a mare is stronger and more lasting than a gelding; and, in addition to this, the farmer has her to breed from. This and the profit which is attached to it is well known in the breeding counties; but why the breeding of horses for sale should be almost exclusively confined to a few northern districts it is not easy to explain. Wherever there are good horses, with convenience for rearing the colts, the farmer may start as a breeder with a good chance of success. In "The Book of the Farm" (1847), Henry Stephens describes a draught gelding (which is termed a Vardy gelding in later editions of the book) and a Clydesdale stallion and mare. He writes "I have chosen a black stallion, brown mare, and grey gelding, as illustrative of the three colours most commonly seen among farm-horses. A black stallion seems the generally favourite colour, and a brown mare is not uncommon, but the grey colour is less in vogue than it was 20 years ago; but why I cannot say. It is said that the feet of grey horses are more tender than of horses of other colours; and, for the same reason, whatever that may be, it is alleged that white feet are more tender than any other colour. I once corresponded on this subject with the veterinary surgeon of one of the regiments of Life Guards, the horses of which are black, and his statement was that he bad not observed any remarkable defect in those horses which happened to have white feet; but that his attention had not before been particularly drawn to the subject. It might be worth while to ascertain whether or not it is found that the horses of the Scots Greys are more liable to tender feet than those of other corps of a different colour." According to The Royal Natural History (1894, edited by Richard Lydekker) "Under the title of cart-horses maybe included all the heavily-built European breeds which originally contained no admixture of foreign blood, and are specially adapted for heavy draught. In England there are four chief races, known as the English black or Shire horse, the breeds of the northeastern counties [presumably the Cleveland Bay and Yorkshire Coach Horse], the Clydesdale, and the Suffolk Punch." "This horse was selected from the noble stock of dray-horses belonging to Messrs. Barclay, Perkins, and Co., London, by the author's friend, Mr. E. Braby. While he is a fine specimen of this breed, he affords a singular illustration of the mode of breeding often practised with respect to these horses and the education which they undergo. He was bred in Leicestershire his grandsire was a Flanders-bred horse, and his grand-dam a Wiltshire mare, his sire was a Wiltshire horse, and his dam a Berkshire mare. At two and a half years old he was sold to a farmer and dealer in Berkshire, on whose grounds he was worked until he was four and a half years old. He was then sold at Abingdon fair to the dealer from whom Messrs. Barclay purchased him. These heavy horses, however, are bred in the highest perfection, as to size, in the fens of Lincolnshire, and few of them are less than seventeen hands high at two and a half years old. Neither the soil, nor the produce of the soil, is better than in other counties ; on the contrary, much of the lower part of Lincolnshire is a cold, hungry clay. The true explanation of the matter is, that there are certain situations better suited than others to different kinds of farming, and the breeding of different animals ; and that not altogether depending on richness of soil or pasture. The principal art of the farmer is, to find out what will best suit his soil, and make the produce of it most valuable. The Lincolnshire colts are also sold to the Wiltshire and Berkshire dealers, as are those that are bred in Warwickshire and Berkshire, at two years, or sometimes only one year old, and worked until the age of four or five years. A dray-horse should have a broad breast, and thick and upright shoulders, (the more upright the collar stands on him the better,) a low forehand, deep and round barrel, loins broad and high, ample quarters, thick fore-arms and thighs, short legs, round hoofs broad at the heels, and soles not too flat. The great fault of the large dray-horse is his slowness. This is so much in the breed, that even the discipline of the ploughman, who would be better pleased to get through an additional rood in the day, cannot permanently quicken him. Surely the breeder might obviate this. Let a dray-mare be selected, as perfect as can be obtained. Let her be put to the strongest, largest, most compact, thorough-bred horse. If the produce is a filly, let her be covered by a superior dray-horse, and the result of this cross, if a colt, will be precisely the animal required to breed from. All our heavy draught horses, and some even of the lighter kind, have been lately much crossed by the Flanders breed, and with evident improvement. Little has been lost hi depth and bulk of carcase ; but the forehand has been raised, the legs have been flattened and deepened, and very much has been gained in activity. The slow heavy black, with his two miles and a half an hour, has been changed into a lighter, but yet exceedingly powerful horse, that will step four miles in the same time, with perfect ease, and has considerably more endurance. This is the very system, as already described, which has been adopted, and with so much success, in the blood-horse, and has made the English racer and hunter, and the English horse generally, what they are. As the racer is principally or purely of Eastern origin, so has the English draught horse sprung chiefly from Flemish blood, and to that blood the agriculturist has recourse for the perfection of the breed. For the dray, the spirit waggon, and not too heavy loads, and for road work generally, a cross with the Flanders will be advantageous ; but if the enormous heavy horse must be used in the coal-waggon, or the dray, we must leave our midland black, with all his unwieldy bulk untouched. As an ordinary beast of lighter draught, and particularly in the neighbourhood of London, the worn-out hackney and the refuse of the coach, and even of the hackney-coach, is used. In the hay-markets of Whitechapel and Camden Town are continually seen wretched teams, that would disgrace the poorest district of the poorest country. The small farmer in the vicinity of the metropolis, himself strangely inferior to the small farmer elsewhere, has too easy access to that sink of cruelty, Smithfield. They who are unacquainted with this part of the country, would scarcely think it possible, that on the forests and commons within a few miles of London, as many ragged, wild, mongrel horses are to be found, as in any district of the United Kingdom, and a good horse la scarcely by any chance bred there. The Suffolk has the second-longest written history of a British horse breed; only the Thoroughbred (racehorse) has a longer documented history. The breed can be traced back to 1506 when it was known simply as the "Old Breed". In the 18th Century, it was known as the Suffolk Sorrel and this smaller, compact, clean-legged type was well-suited to the heavy clay soil conditions of East Anglia. In the 1880 Stud Book, Herman Biddell traced all Suffolks back to a stallion foaled in 1768 near Woodbridge. 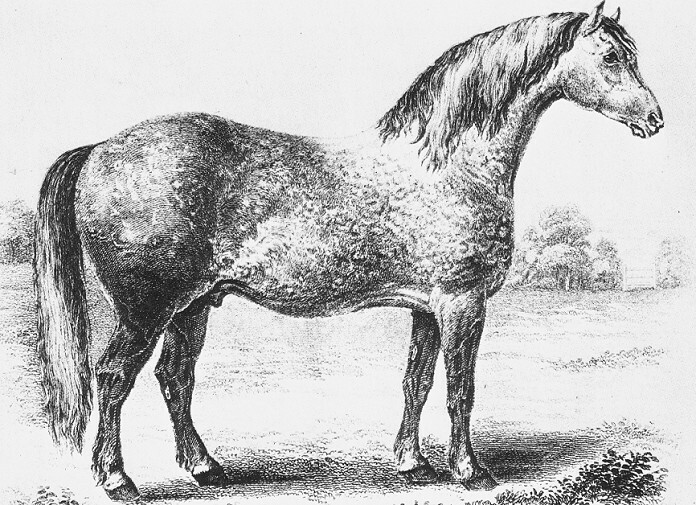 In 1773, this stallion was advertised by the owner, Thomas Crisp of Ufford as "light chestnut horse full fifteen and a half hands [1.58 metres], five years old, to set good stock for coach or road". The popular name of Suffolk Punch alludes to its compact, relatively short-legged conformation. 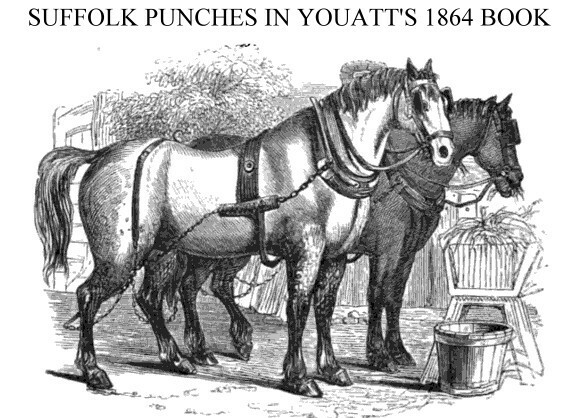 According to Youatt, the original Suffolk Punch horse had almost become extinct by 1831 and had to be revived by crossing to heavy horses from Yorkshire. The new Suffolk Punch retained the original chestnut colour (there are 7 permissible shades), but was taller and had higher, finer shoulders than its predecessor. The stud book was founded in 1880 and Herman Biddell (secretary of the Suffolk Horse Society) is credited with properly establishing the breed. "The Horse, With A Treatise On Draft" by William Youatt (1831) states: Horses for slower draught, and sometimes even for the carriage, are produced from the Suffolk Punch, so-called from his round punchy make, and descended from the Norman stallion and the Suffolk cart mare. The true Suffolk, like the Cleveland, is now nearly extinct. It stood from fifteen to sixteen hands high, of a sorrel colour; was large headed; low shouldered, and thick on the top; deep and round chested; long "backed; high in the croup; large and strong in the quarters; full in the flanks; round in the legs; and short in the pasterns. It was the very horse to throw his whole weight into the collar, with sufficient activity to do it effectually, and hardihood to stand a long day's work. The present breed possesses many of the peculiarities and good qualities of its ancestors. It is more or less inclined to a sorrel colour; it is a taller horse; higher and finer in the shoulders; and is a cross with the Yorkshire half or three-fourths bred. The excellence, and a rare one, of the old Suffolk (the new breed has not quite lost it) consisted in nimbleness of action, and the honesty and continuance with which he would exert himself at a dead pull. Many a good draught-horse knows well what he can effect; and, after he has attempted it and failed, no torture of the whip will induce him to strain his powers beyond their natural extent. The Suffolk, however, would tug at a dead pull until he dropped. It was beautiful to see a team of true Suffolks, at a signal from the driver, and without the whip, down on their knees in a moment, and drag everything before them. Brutal wagers were frequently laid as to their power in this respect, and many a good team was injured and ruined. The immense power of the Suffolk is accounted for by the low position of the shoulder, which enables him to throw so much of his weight into the collar. Although the Punch is not what he was, and the Suffolk and Norfolk farmer can no longer boast of ploughing more land in a day than any one else, this is undoubtedly a valuable breed. The Duke of Richmond obtained many excellent carriage horses, with strength, activity, and figure, by crossing the Suffolk with one of his best hunters. The Suffolk breed is in great request in the neighbouring counties of Norfolk and Essex. Mr. Wakefield, of Barnham in Essex, had a stallion for which he was offered four hundred guineas. Seven year old Suffolk Punch Stallion in the mid 1800s. "The true, pure-blooded SUFFOLK PUNCH is now nearly extinct, having been so frequently crossed with other breeds that its individuality has been almost entirely lost. The old Suffolk Punch, so called from its round, punchy form, is a wonderful animal for pulling, being built as if expressly for the purpose of dragging great weights with unflinching perseverance. A team of these Horses needs no incitement by the whip, but as soon as they hear the command of their driver, they fling their whole weight into the collar, and almost throw themselves on their knees in their anxiety to fulfil their task. They seem to be perfectly aware of their powers, and to be jealously tenacious of their supremacy, for even if they find after one or two efforts that the load resists their best endeavours, they do not refuse to exert themselves any further, as is often the case with draught Horses, but will persevere in pulling until they drop with fatigue. The low, heavy shoulder, and strong quarters of the Suffolk Punch are of infinite service in drawing the plough or the cart, and its hardy frame and determined disposition enable it to support a hard day’s labour without being overcome. These valuable characteristics have been employed in improving the breed of carriage Horses, for it is a wonderful fact, and one which cannot be too carefully considered, that mental traits are more enduring than bodily form, and that a crossed breed derives its true value, not so much from the outward form which is obtained by the cross, but from the mental characteristics that are transmitted through a series of generations. The reader may remember that in the case of the greyhound, a bull-dog cross was introduced in order to impart courage and determination to a breed that had sacrificed everything to speed, and that although the bull-dog form was totally eradicated in a few generations, the bull-dog spirit remained. 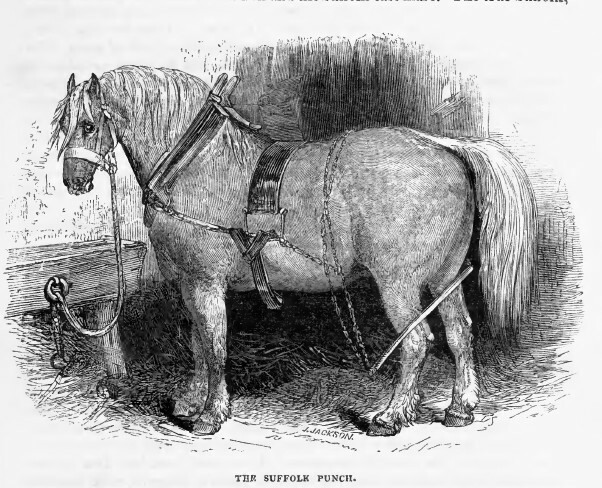 Thus with the Suffolk Punch. Some of the best carriage Horses have been obtained by crossing the Suffolk Punch with a thorough-bred hunter, so as to unite the excellence of the two animals, giving speed and rapid force to the draught Horse, and the power of pulling to the hunter." 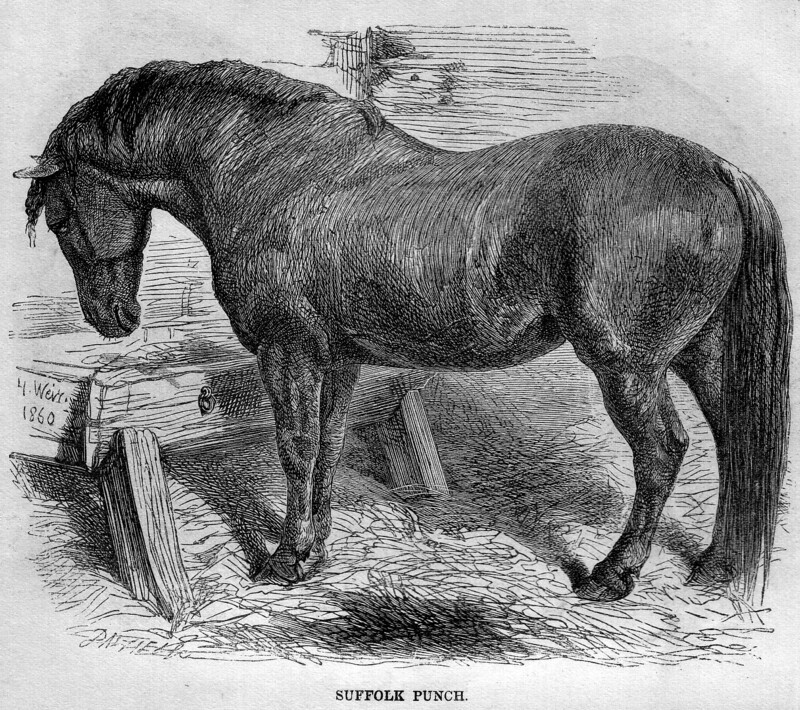 According to William Youatt’s 1864 work "The Complete Grazier And Farmer's And Cattle-Breeder's Assistant": The Suffolk Punch (fig. 26), which is so denominated from his peculiar shape, and said to have originated from a cross between a French stallion of a breed that has been long celebrated in Normandy, and a Suffolk cart-mare, is a true farmhorse. This breed has been preserved more pure than many others; and, being neither handsome enough for a gentleman's carriage, nor weighty enough for a London cart or wagon, it is seldom employed for any other than agricultural labour. The old Suffolk Punch is now rarely to be met with. He was rather a plain made horse, with large head, coarse muzzle, low fore-hand, straight back, flat side, shoulders too far forward, hind quarters rather high about the hips, deep-bellied and full in the flank, round legs and short pasterns. This is the account which Mr. Culley gives of them; and we immediately recognise in this description the horse that could throw his whole weight into the collar, and stand, without shrinking, a long day's work. The figures on the preceding page are portraits of a pair of capital Punches, which formerly belonged to that eminent farmer, Mr. Wakefield of Burnham, in Essex, who was remarkably successful in breeding this stock, and at one time was in possession of a stallion of the breed – Britton - for which he refused 400 guineas. "Lastly, we have the well-known Suffolk punch of East Anglia, famed for its steadiness of draught, and the pertinacity with which it will exert itself against a dead pull. The original breed derived its name from the stout and "punchy" form, and was further distinguished by the colour being light dun or sorrel, sometimes darkening to chestnut, with lighter mane and tail. The height was medium, the pace rather slow, but the power of endurance very great, and the constitution hardy. The form was, however, somewhat ugly, the head being large, with a coarse muzzle, the neck short, and the shoulder low and heavy. On the other hand, the limbs were short, and the back straight, with wide loins and well-developed haunches. The breed, which has of late years been much modified by mixture, is believed to have been introduced from Normandy; and Low is of opinion that its dun or sorrel colour indicates a near affinity with the wild tarpan of the Asiatic steppes." Sir Walter Gilbey described the Suffolk Punch in his 1910 book "Farm Stock 100 Years Ago": This breed, otherwise known as the "Sorrel" by reason of its distinctive colour had for a long period been celebrated for its working qualities. It was peculiar to Suffolk and Norfolk, and was esteemed for strength, activity and endurance. Arthur Young, who travelled in Suffolk in 1764, 1776 and 1779, thought that the true breed was disappearing when he last visited the county. The old Suffolk Punch was "yellowish or sorrel" (dun) in colour, with a white blaze; was punchy in shape and seldom over 15.2 in height ; as a farm horse it had no equal. Young refers to a Suffolk Punch belonging to Mr. Weeden, which drew 12 and a half quarters of wheat in a waggon up a hill for more than I 2 rods. There were some good examples of the breed remaining at rather a later period. Daniel (Rural Sports, supplementary vol 1813) states that, at the sale of Sir Robert Harland's horses in October, 1812, the following prices were realised, showing "the estimation in which Suffolk Punches are held": - 13 horses averaged £32 and 8 shillings; 16 horses averaged £61 and 4 shillings; 4 horses averaged £81; 5 horses averaged £140; 3 three-year-old colts averaged £53; 2 two year-old colts averaged £51; 6 yearlings, £44 each; and 6 suckers £37 18 shillings and sixpence each. The value of money in those days must be borne in mind with reference to these figures. The prices were equal to about twice the amount in our own day. It was the importation of Yorkshire half-bred sires that did much to change the character of the Suffolk Punch. The infusion of this blood wrought increase of height and size. It also brought about a change of colour, but the mixed breed retained many of the good qualities of the old stock, which is said to have been derived from Norman stallions put to Suffolk cart-mares. Culley has left it on record that the old Suffolk Punch could plough more land in a day than any other horse. Other authorities attribute his speed in the plough to the lightness of the soil ; but. whatever the truth, there can be no doubt of his merits. Arthur Young coupled the breed with the Black, as the only two varieties of carthorse in England deserving of mention. It remains to add that, during the last fifty years, the Suffolk horse has been classed as one of the best breeds of heavy horses in England. Until the 1800s, the Suffolk Punch was the only distinctive heavy horse breed in Britain, the other varieties of heavy horse being variable from region to region. Numerous other heavy horses existed, but didn’t conform to a particular type apart from their large size and often black in colour. Until the mid 1800s, this type was known as the Old English Black Horse or Heavy Black Horse. The Old English Black Horse may trace back to stallions brought over from Europe by Norman invaders and bred with local mares. Despite its name, black, bay and brown were all common colours while red/strawberry roans, greys and chestnuts also existed. The colours appeared to vary from region to region. White markings were a matter of superstition – some considered four white socks/stockings and a wide white blaze desirable, while others believed white legs to be associated with weak hooves. 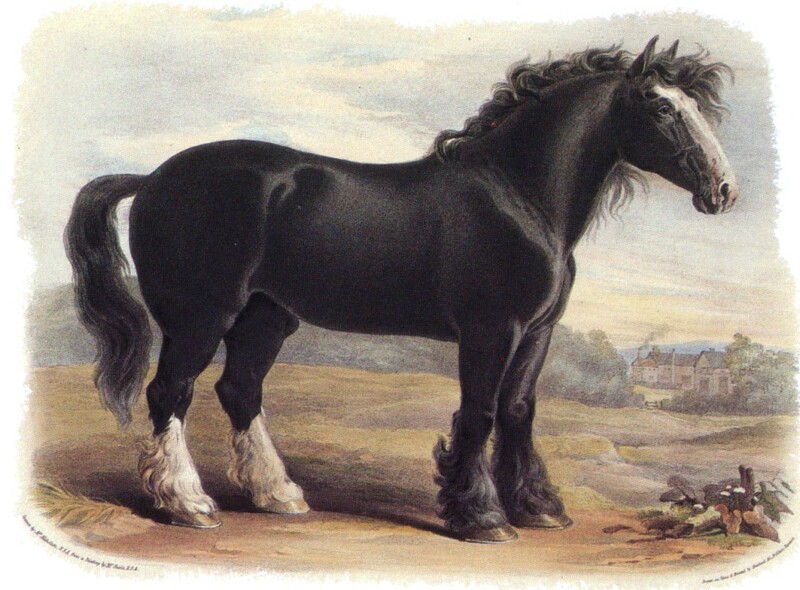 Above: "The Olde English Black Horse Stallion, by Old Blacklegs, from a mare of the Dishley Breed; bred by Mr Broomes, at Ormiston, Derby" Painting by Shiels of a horse descended from Bakewell’s black Leicester Horses. The Heavy Black Horses were crossed to draft horses imported from the Low Countries. 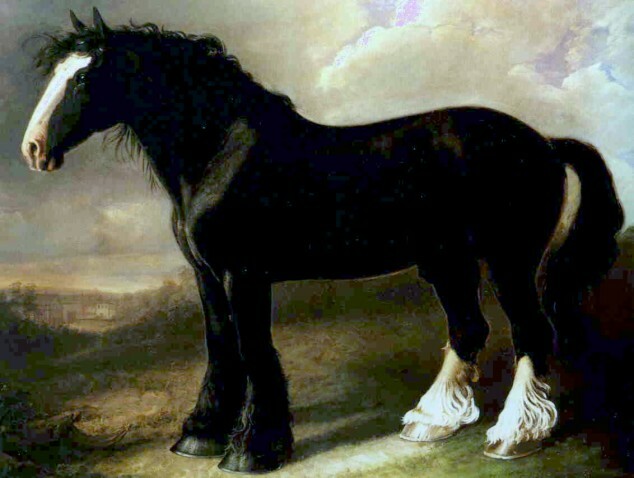 During the late 17th Century, under the reign of William III, Dutch engineers imported large Dutch horses (probably the forerunners of the modern Brabants, Flemish and Friesians) to improve the English cart horses used for draining the Lincolnshire Fens resulting in a local variety known as the Lincolnshire Black. Other Black Horse bloodlines were bred in Derbyshire and Staffordshire. 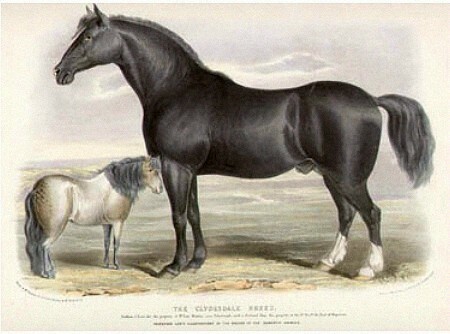 Robert Bakewell developed the Black Horse of Leicestershire which was the forerunner of the Shire Horse of the Midlands. The modern Shire type was established in Leicestershire before 1790, in part due to his efforts and the foundation sire of the breed is believed to be a black horse called "Packington Blind" who sired the first Shires to appear in the "English Cart-Horse Stud Book". Ultimately, the Old English Black Horse vanished, being absorbed into the Shire and Clydesdale breeds. "The Horse, With A Treatise On Draft" by William Youatt (1831) describes the forerunner of the Shire horse at great length, having written only a paragraph on the Clydesdale. At the time, these heavy horses were evidently variable in type, the different types being suited to different types of work in either the countryside or town. 'The Heavy Black Horse is the last variety it may be necessary to notice. It is bred chiefly in the midland counties from Lincolnshire to Staffordshire. Many are bought up by the Surrey and Berkshire farmers at two years old, - and being worked moderately until they are four, earning their keep all the while, they are then sent to the London market, and sold at a profit of ten or twelve per cent. It would not answer the breeder's purpose to keep them until they are fit for town-work. He has plenty of fillies and mares on his farm for every purpose that he can require; he therefore sells them to a person nearer the metropolis, by whom they are gradually trained and prepared. The traveller has probably wondered to see four of these enormous animals in a line before a plough, on no very heavy soil, and where two lighter horses would have been quite sufficient. The farmer is training them for their future destiny; and he does right in not requiring the exertion of all their strength, for their bones are not yet perfectly formed, nor their joints knit; and were he to urge them too severely, he would probably injure and deform them. By the gentle and constant exercise of the plough, he is preparing them for that continued and equable pull at the collar, which is afterwards so necessary. These horses are adapted more for parade and shew, and to gratify the ambition which one brewer has to outvie his neighbour, than for any peculiar utility. They are certainly noble-looking animals, with their round fat carcases, and their sleek coats, and the evident pride which they take in themselves; but they eat a great deal of hay and corn, and at hard and long-continued work they would be completely beaten by a team of active muscular horses an inch and a half lower. The only plea which can be urged in their favour, beside their fine appearance, is, that as shaft-horses, over the badly-paved streets of the metropolis, and with the immense loads they often have behind them, great bulk and weight are necessary to stand the unavoidable shaking and battering. Weight must be opposed to weight, or the horse would sometimes be quite thrown off his legs. A large heavy horse must be in the shafts, and then little ones before him would not look well. Certainly no one has walked the streets of London without pitying the poor thill-horse, jolted from side to side, and exposed to many a bruise, unless, with admirable cleverness, he accommodates himself to every motion; but, at the same time, it must be evident, that bulk and fat do not always constitute strength, and that a compact muscular horse, approaching to sixteen hands high, would acquit himself far better in such a situation. The dray-horse, in the mere act of ascending from the wharf, may display a powerful effort, but he afterwards makes little exertion, much of his force being expended in transporting his own overgrown mass. These heavy horses are bred in the highest perfection, as to size, in the fens of Lincolnshire, and few of them are less than seventeen hands high at two and a half years old. Neither the soil, nor the produce of the soil, is better than in other counties; on the contrary, much of the lower part of Lincolnshire is a cold, hungry clay. The true explanation of the matter is, that there are certain situations better suited than others to different kinds of farming, and the breeding of different animals; and that not altogether depending on richness of soil or pasture. The principal art of the farmer is, to find out what will best suit his soil, and the produce of it. A dray-horse should have a broad breast, and thick and upright shoulders, (the more upright the collar stands on him the better;) a low forehand, deep and round barrel, loins broad and high, ample quarters, thick fore-arms and thighs, short legs, round hoofs, broad at the heels, and soles not too flat. The great fault of the large dray-horse is, his slowness. This is so much in the breed, that even the discipline of the ploughman, who would be better pleased to get through an additional rood in the day, cannot permanently quicken him. Surely the breeder might obviate this. Let a dray-mare be selected, as perfect as can be obtained. Let her be put to the strongest, largest, most compact, thorough-bred horse. If the produce be a filly, let her be covered by a superior dray-horse, and the result of this cross, if a colt, will be precisely the animal required to breed from. The largest of this heavy breed of black horses are used as dray-horses. The next in size are sold as waggon-horses; and a smaller variety, and with more blood, constitutes a considerable part of our cavalry, and is likewise devoted to undertaker's work. All our heavy draught horses, and some even of the lighter kind, have been lately much crossed by the Flanders breed, and with evident improvement. Little has been lost in depth and bulk of carcase; but the fore-hand has been raised, the legs have been flattened and deepened, and very much has been gained in activity. The slow heavy black, with his two miles and a half an hour, has been changed into a lighter, but yet exceedingly powerful horse, who will step four miles in the same time, with perfect ease, and has considerably more endurance. This cut contains the portrait of a favourite dray-horse belonging to Messrs. Meux, and painted by Mr. Ward, R. A., to whose portfolio we hope frequently to have recourse. It is the Suffolk crossed, although not so deeply as some, with the Flanders. This is the very system, as we shall presently describe, which has been adopted with such success in the blood-horse, and has made the English racer and hunter, and the English horse generally, what it is. As the racer is principally or purely of Eastern origin, so has the English draught horse sprung chiefly from Flemish blood, and to that blood the agriculturist has recourse for the perfection of the breed. For the dray, the spirit waggon, and not too heavy loads, and for road-work generally, a cross with the Flanders will be advantageous; but if, in London, the enormous heavy horse must be used in the coal-waggon, or the heavier load of the wharf, we must leave our Midland Black, with all his unwieldly bulk, untouched. As an ordinary beast of lighter draught, and particularly in the neighbourhood of London, the worn out hackney and the refuse of the coach, and even of the hackney-coach is used. In the hay-markets of St. James's and Whitechapel are continually seen wretched teams, which would disgrace the poorest district of the poorest country. The small fanner in the vicinity of the metropolis, himself strangely inferior to the small farmer elsewhere, has too easy access to Smithfield, that sink of cruelty. They who are unacquainted with this part of the country, would scarcely think it possible, that on the forests and commons within a few miles of London, as many ragged, wild, mongrel horses are to be found, as in any district of the United Kingdom, and a good horse is scarcely by any chance bred there. "AN elephant among Horses, the mixed Flemish and Black Draught Horse is familiar to all Londoners as drawing the heavy drays on which beer is conveyed from the breweries to the purchaser. This enormous animal is really needed for his peculiar work, although a natural emulation that exists between the different firms leads them to rival each other in size and magnificence of their dray Horses, as well as in the excellence of their beer. It is a general idea that the dray Horses derive their huge bulk from being fed on grains and permitted to drink beer, and that the dray-men owe their large proportions and rubicund aspect to similar privileges. Such is, however, not the case, as the Horses are bred especially for the purpose, and the men are chosen with an eye to their jovial aspect. It would never answer for a brewer to keep a poor, wizened, starveling drayman, for the public would immediately lay the fault on the beer, and transfer their custom elsewhere. The dray Horse is a very slow animal, and cannot be permanently quickened in his pace, even if the load be comparatively light. Its breast is very broad, and its shoulders thick and upright, the body large and round, the legs short, and the feet extremely large. The ordinary pace of the heavy Draught Horse is under three miles per hour, but by a judicious admixture of the Flemish breed, the pace is nearly doubled, the endurance increased, and the dimensions very slightly diminished. 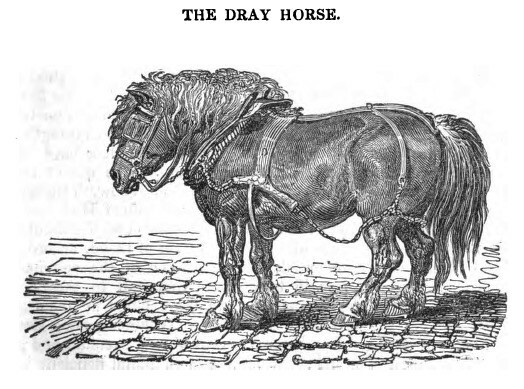 The great size of the dray Horse is required, not for the absolute amount of pulling which it performs, but for the need of a large and heavy animal in the shafts to withstand the extreme jolting and battering that takes place as the springless drays are dragged over the rough stones of the metropolis. And as a team of two or three small leaders and one huge wheeler would look absurd, it is needful to have all the Horses of uniform dimensions and appearance. The genuine dray Horse is a noble beast, and it is very pleasant to see the kindly feelings which exist between them and their drivers. The long whip is carried upon the drayman’s shoulders more as a badge of office than as an instrument of torture, and if used at all, it is gently laid upon the Horse’s back, accompanied with some endearing language, which is very intelligible to the Horse, but not to be comprehended by ordinary human intellects." 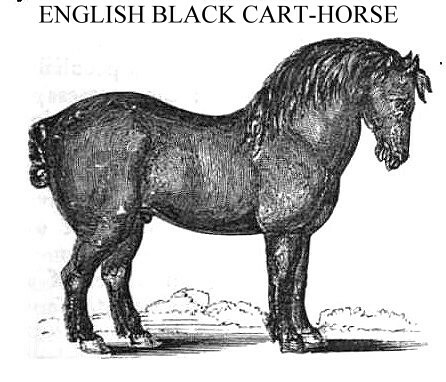 According to "The Complete Grazier And Farmer's And Cattle-Breeder's Assistant" by William Youatt and R S Burn (1864): The Black Cart-horse, par excellence, the 'Old English Black' (fig. 27), of which the annexed is a delineation, is mostly bred in Leicester, Northampton, and Lincoln, and some of the neighbouring counties; but the largest kind, and that principally used in brewers' drays and other heavy road-work, is chiefly reared m the fens of Lincolnshire. These counties have been from time immemorial in possession of a celebrated breed of black horses, from the lighter kind of which some of our heavy cavalry were formerly mounted. An improvement upon the original stock is said to have been effected by the late Earl of Chesterfield, who, during his embassy at the Hague, sent over six Zetland mares to Bretby, his lordship's seat in Derbyshire, whence their descendants found their way into Leicestershire, and were further improved by an importation of West Friesland mares, by Mr. Bakewell. From a cross between these and a native stallion, that gentleman produced some noble cattle. By this mixture of blood Mr. Bakewell got rid of much of the length and looseness of form, and the long, thick, hairy legs attributed to the original breed, and obtained a more compact and short-limbed animal, possessed of greater activity, and, as he alleged, of a better constitution, being more hardy and better able to stand constant work. If he carried this to a somewhat extravagant length, and sacrificed a little too much of that bone which, in every horse of strength, must have considerable development for the attachment of muscles, this defect has been rectified, and in that respect there is at present no deficiency in the breed. By an inspection of the Flanders horse now constantly imported, and by means of which a great improvement has evidently been effected in the cart-horse, it will be seen that our present stock is far superior to that by which it was said to have been improved. Although the black colour, with a blaze on the face, and some white on the legs, may be regarded as the distinctive marks of this race, yet, in consequence of various crosses, they are now to be found of all colours. They are generally small-headed compared with their size, short-necked, with thick shoulders, short in the back, deep and round in the body, with broad back and loins, the quarters thick, the thighs and fore-arms peculiarly strong, and the legs short, with large round hoofs; they possess great strength, and, although very slow, and apparently sluggish in their action, are not deficient in bottom, but from their weight, as well as their natural power, go through draught work that could be performed by few other animals. That particular species, commonly known as the Dray-horse, is more especially a model of symmetry and strength combined. Not the least of his perfections is his extreme docility, which cannot fail of being an object of admiration to everyone who witnesses his performances in the crowded streets of the metropolis. Because most colts were gelded young in order to be work animals, the use of the travelling stallions to cover mares around the country helped to standardise the breed. Not until 1878 was the English Cart-Horse Society founded (becoming the Shire Horse Society in 1884) and stud books and pedigrees maintained. The show-ring standard called for heavily feathered feet, a trait unsuited to many farming conditions. For this reason, the longer-limbed, less heavily feathered Clydesdale is better known in the USA than the iconic Shire horse. "The Old English Black or Shire horse was characteristic of the fen-districts and some of the other midland counties from whence it has extended north and south, and it also occurs in the so-called Low Countries and other parts of the Continent. 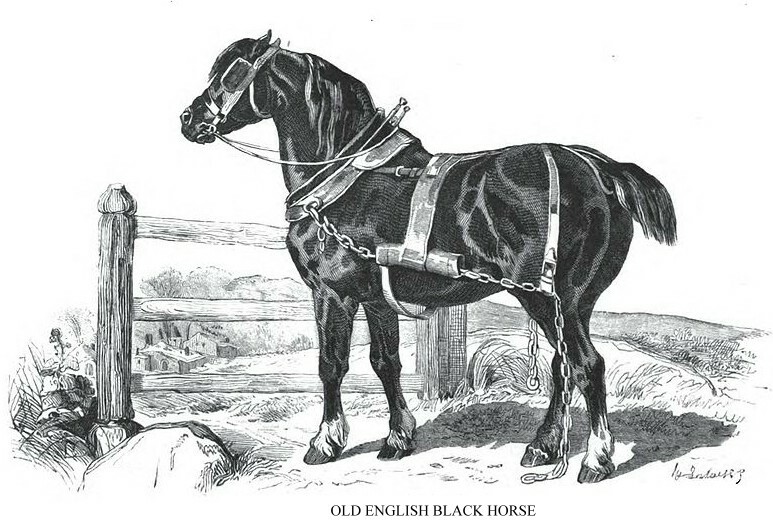 Typically the black horse, as shown in the illustration on p. 489, has a round and massive body, a broad chest, a powerful muscular neck, and short, stout, and long-haired limbs; its physical strength being great, but its speed slight. The size varies considerably; the larger and most powerful races being produced in the fens. The more modern breed generally has a white star on the forehead, and more or less of the same colour on the feet and legs, and often on the muzzle. Low says that "the main defects of his conformation and temperament are his too great bulk of body, and want of action and mettle. For a pull with a heavy weight he is admirable; but he steps out short, and is slow in all his motions." Of recent years the aim of breeders has been to remove these defects. 1894: Shire stallion "Mars Victor"
To the north of the Humber the native breeds of cart-horses are of smaller-bulk, and generally brown, or still lighter in colour; while they are altogether more active than the black horse. This lighter build appears to be largely due to an infusion of the blood of the higher races among the horses of these districts, which is not wanting even among those employed solely for heavy draught." Sir Walter Gilbey described the Shire horse in his 1910 book "Farm Stock 100 Years Ago": This is the modern name of the famous breed which was formerly known as the Great, Large Black, or Heavy Black Horse. It was, above all, the cart-horse, and was principally bred in the Midlands - Derby, Leicester, Warwick, Stafford and Lincoln shires - those reared in the last-named county being the largest. The Black was the best recognised breed of draught horse England possessed. The Ashby Black Stallion Show at Easter, where sires were offered on hire for the season, was an institution. Yearling Blacks were sold at certain markets or fairs devoted specially to them - Ashby, Loughborough, Burton-on-Trent, Rugby, and Ashbourne. The graziers who bought the yearlings kept them till two or two off, when they sold them to farmers, who worked them lightly in the plough and then sold them, ready for work in the London drays. The distinctive colour of the breed, now known as the " Shire," is gradually disappearing, and a black horse is now the exception in pedigree stock, though the old colour sometimes occurs to remind us of the original strain. The Black had had a chequered history. In the days of armour it was the war horse; when heavy armour was discarded it still furnished remounts to Dragoons, and remained, up to the earlier years of the last century, in some request (though lighter horses were more in demand) for Army purposes. The Black was also in general use for coach and carriage work when vehicles were weighty and roads bad ; but improvements in carriages and roads led to its disuse. Various statements have been made concerning improvements in the Black. Lord Chesterfield, when Ambassador (about 1755-60) at the Hague, brought home half-a-dozen Zealand mares, which were stabled at Bretby, in Derbyshire. One of the Earls of Huntingdon brought "a set of coach-horses of the black breed" from the Low Countries. At first he found it difficult to persuade his tenants by Trentside to send their mares to them; but when a few foals had been got by these stallions, the breeders at once saw that the youngsters were superior to the foals got by local stock and eagerly sent their mares to the Earl's horses. Bakewell appears to have believed in these traditions, for he, with Mr. George Salisbury, visited Germany and Holland, and brought home half-a-dozen " Dutch or Flanders Mares." These proved of use in improving the Leicestershire Blacks ; so much so that they became known as " Bakewell's Blacks." George Culley took some horses of the Bakewell breed to Northumberland, when he went thither to establish himself as a farmer, and these were the means of introducing much-needed improvement into the Northumbrian cart-horses, which appear to have been of nondescript character. It was the custom of the Midland breeders to use only the mares for farm-work. All were used for breeding, and the geldings were sold for farm-work in the south and west, the finest going to London as drayhorses; some, according to Culley (1807), were still sold as Cavalry remounts, Youatt (The Horse, 1831) says : " A smaller variety, with more blood, constitutes a considerable part of our Cavalry." About the end of the eighteenth century some Midland farmers began to replace their Blacks by oxen. When Marshall visited these parts of England in 1796 the "spirit for working oxen appeared to be gaining ground apace among superior managers." Culley refers to the extraordinary pride taken by the south country farmers in their teams of Blacks. He had seen six stallions in line, each adorned with fringe and tassels, "enough to half-load a common Yorkshire cart-horse." The leader of this team wore six bells, the next five, and so on to the shaft-horse, which only wore one. Equal pride in their Black horses was taken by the London brewers and their men. Youatt attributes the development of the Clydesdale to the Dukes of Hamilton who crossed Lanark mares with imported stallions from Flanders. In the 1720s, the 6th Duke of Hamilton imported six Flemish stallions to improve the breed. 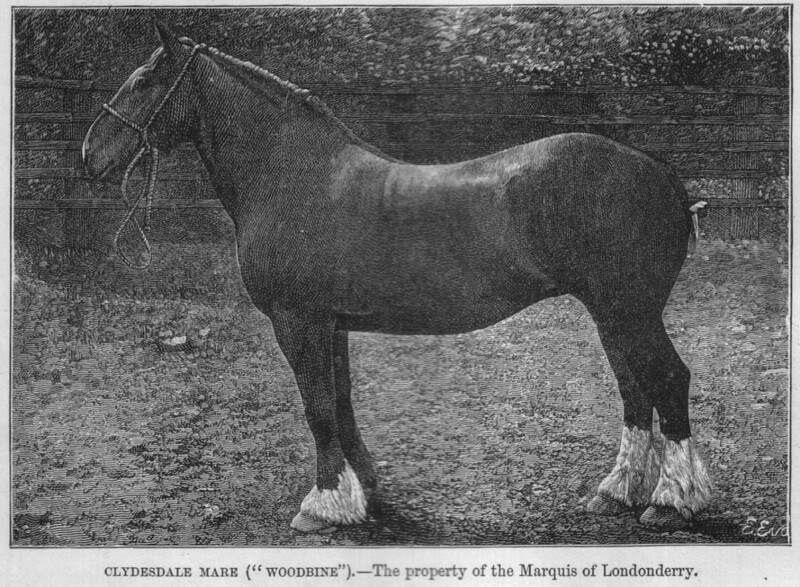 Early influential stallions were "Glancer" (foaled 1806), "Broomfield Champion" and "Clyde" (a son of Broomfield Champion) In the late 19th Century, Lawrence Drew and David Riddell used Shire mares to further improve the Clydsedale (and apparently believed the Shire and Clydesdale to be essentially the same breed). The breed seems to have originated through crossing Flemish, Belgian and/or English heavy horses to the local farm horses of the upper Clyde Valley in Lanarkshire, creating a variety known as the Clydesman's horse or Scotch Farmhorse. Crossing between Clydesdale and Shire was commonplace and they are so similar that they are often judged together at agricultural shows and may even be considered two forms of the same breed, although they are kept genetically separate. By the 1830s, grey and chestnut fell out of favour in the breed with the result that bay and brown became the standard colours. 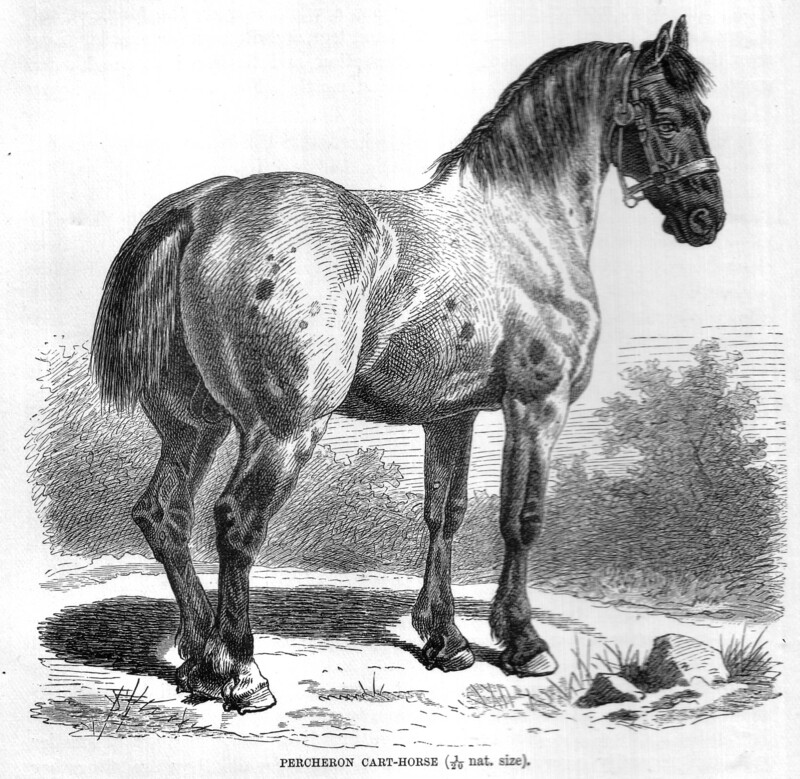 The 1878 Stud Book shows that there inbreeding to foundation stock was relatively low, although a stallion called Darnley greatly influenced the breed. feathered legs. The cleaner legs and faster action meant Clydesdales, rather than Shires, were exported to the USA. "The Horse, With A Treatise On Draft" by William Youatt (1831) described the Clydesdale only briefly (reserving the bulk of the text for the Heavy Black Horse: The Clydesdale is a good kind of draught-horse, and particularly for farming business and in a hilly country. It derives its name from the district on the Clyde in Scotland, where it is principally bred. The Clydesdale horse owes its origin to one of the Dukes of Hamilton, who crossed some of the best Lanark mares with stallions which he had brought over from Flanders. The Clydesdale is larger than the Suffolk, and has a better head, a longer neck, a lighter carcase, and deeper legs; strong, hardy, pulling true, and rarely restive. The southern parts of Scotland are principally supplied from this district; and many Clydesdales, not only for agricultural purposes, but for the coach and the saddle, find their way to the central, and even southern counties of England. Dealers from almost every part of the United Kingdom attend the markets of Glasgow and Rutherglen. 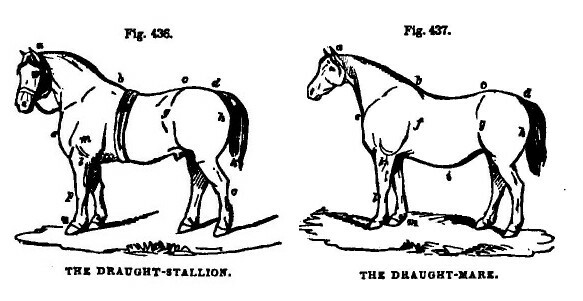 In "The Book of the Farm" (1847) Henry Stephens illustrates his description of Draught Stallion and Draught Mare with examples of the Clydesdale breed. His description of the Clydesdale stallion reads like an advertisement (a "sure foal-getter" and an "excellent traveller") with good cause – in those days, a stallion would travel from farm to farm to cover the mares. "Fig. 436 as here shewn is the portrait of the black draught stallion Champion, bred by Mr James Steedman, Boghall, in the county of Mid-Lothian. He is of the true Clydesdale breed. He gained the first prize at the Highland and Agricultural Society’s Show at Glasgow in October, 1837, and obtained premiums elsewhere. He is a sure foal-getter. He is fully 17 hands high, and though otherwise a large animal, being 8 feet 7 inches in length, his action is high and uncommonly light. On comparing him generally with the gelding just described, though his body is longer, both hind and fore quarters are long and deep, and exhibit a large display of muscle. His middle is somewhat small, as is almost always the case with stallions which have served many mares. Like all stallions, his neck rises beautifully from his body (B C), in a full crest from (B) to (A), evincing that castration has the effect of reducing the size of the muscles of the neck of all geldings. The shoulder slopes well back from (E) to (B), giving freedom of action to the fore-legs, while the muscle at (M) being fully developed, assists in imparting power to that action. The hind-quarter, from (G) to (H), is long and deep. The foreleg is straight, and short from knee to fetlock, (P) to (N), the bone under the knee strong, and the fore-arm (L) flat and broad. The hind-legs (O) are remarkably handsome. The sweep of line from the crown of the head along the back to the tail-head is truly elegant, giving a very fine top to the quarter, and the plenitude of hair in the tail (D K) indicates great strength of back. His eye is good, though somewhat small, the ratch of white down his face is against his cast of countenance; and having the 2 hind-legs white is also against his general appearance. His disposition a remarkably docile and his whole demeanour harmless. His constitution is good, and he is an excellent traveller. These are a few of his dimensions: from (A) to (B) 51 inches; from (B) to (C) 30 inches; from (C) to (D) 22 inches; in all 8 feet 7 inches. Length of face 26 and a half inches; breadth of face across the eyes 11 inches; length of ears 6 and a half inches, breadth across the hook-bones 30 inches; girth behind the shoulder 90 inches; girth of forearm 28 inches; girth of bone below the fore-knee 12 inches; height of top of quarter from the ground 67 inches; girth of neck at the onset of the head 39 inches; girth of muzzle 24 inches; and width of counter 22 inches." "Fig. 437 as here shewn is the portrait of a brown mare belonging to Mr George Bagrie, Monkton, near Dalkeith, Mid-Lothian. She gained the first premium at every show of stock she was ever exhibited. The white ratch down her face, and so much white on her legs, detract from her general appearance; but notwithstanding these drawbacks, she is an exceedingly handsome mare. You have only to look at the Plate to observe the beautiful flowing lines of her whole contour, and also the great substance of both fore and hind quarter. The rise and crest of her neck from (B) to (A), and from (E) to (A) are remarkably fine. The back from (B) to (C) is somewhat hollow, and there is a corresponding depression of the belly at (I), both the consequences of foal-bearing, as well as a slackness of the flank in front of (G), the usual deficiency there of brood-mares. The top of the rump from (C) to (D) is also very fine. 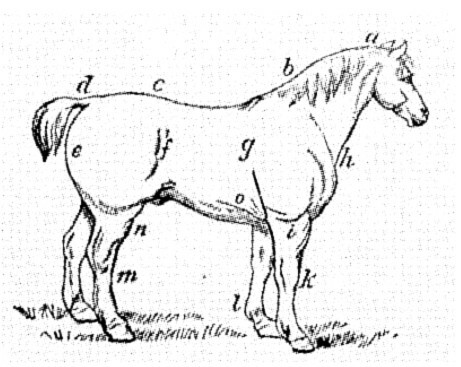 The shoulder slopes well from (E) to (B), indicating good action; the muscles are well developed on the forequarter from (E) to (F) indicating power in draught; and the ribs are round, and long from (F) to (G), a favourable configuration in the brood-mare for giving room for the growth of the foetus. The hind-quarter from (G) to (H) is long. The legs are placed directly under the body, the fore-knee (L) being broad and strong, the back of the fore-leg from the fetlock (M) to the body straight, and the fore-arm (K) broad and flat. I have no measurement of the dimensions of this mare, which I regret, as losing a means of comparison with the gelding and stallion. Beside roundness and length of rib, a brood-mare should be wide across the hook-bones and the pelvis, to afford room for the growth and subsequent egress of the foal. "ONE of the best Horses for ordinary heavy work is the CLYDESDALE CART HORSE, an animal which has derived its name from the locality where it was first bred. It is larger than the Suffolk Punch, and owes its origin to the Lanark Horse, crossed with the large Flemish breed. In temper it is docile, and it is possessed of enormous strength and great endurance. The pure breed is large and heavy, and is notable for a very long stride. When judiciously crossed with other breeds it produces offspring which are extensively employed in the carriage and for the saddle. The figure of the Clydesdale Cart Horse which accompanies this brief notice is a portrait of a remarkably fine animal named Prince Albert." "The Complete Grazier And Farmer's And Cattle-Breeder's Assistant" By William Youatt and R S Burn (1864) describes the Clydesdale: The Clydesdale or Lanarkshire race are strong, active, hardy animals, of the middle size, remarkably steady, true pullers, usually of sound constitution, and well adapted for all the purposes of husbandry; indeed, for the purposes of the farm, they cannot be surpassed. They are, therefore, deservedly in esteem among the northern farmers, particularly on heavy soils; they are not, however, so active, nor so well adapted for light land, as the Clevelands; neither are they so handsome. Their prevailing faults are a tendency to length of limb, and lightness of body, and they are apt to become heated by their work; but, apart from this, they are valuable farm-horses, and will work with more strength and continuance than almost any other kind; but they also require a larger amount of food than others. They are said to have descended from a cross, by one of the Dukes of Hamilton, between some Flemish stallions, imported many years ago, and some Lanarkshire mares, and they derive their appellation from the district on the Clyde where they are chiefly found. The story of their origin is, however, denied by a very intelligent writer on the subject, who considers them an improved breed of the old Lanark species. They have, long ago, made their way into the bordering counties of England, and there can be little doubt that, when their good qualities are more truly appreciated, they will travel still farther south. This valuable breed of horses is described by Mr. Aiton as being from fourteen to sixteen hands in height. If beyond that they are generally unshapely, and deficient in spirit - the effect of crossing small jaded mares with overgrown stallions. They are round, fleshy, well-proportioned, strong, and heavy, without being too coarse or clumsy. The head is in due proportion to the body; rather small than large, yet somewhat plain, and not so full and prominent below the eyes as some of the English breeds: nevertheless, the nostrils are wide, the eyes full and animated, and the ears erect. The neck is strong, thick, and fleshy, with a good curvature, and the mane strong and bushy. They are broad in the breast and thick in the shoulders, the shoulder-blades being nearly as high as the chine, and without that direction backwards which is so important in the saddlehorse. The arm tapers to the knee; the leg is short and strong, but well-shaped and clean. The hoof is round, of a black colour, tough and firm, with the heels wide, and no long hair on the legs except a tuft at the fetlocks; the body round and heavy, yet not disproportionately so; the belly of a medium size, neither hanging down nor tucked up, and the flank full. The back is straight and broad, but not too long; the loin broad and a little elevated; the haunch bones are visible, but not prominent, and there is but a short space between them and the ribs. The sides, from the shoulders to the hips are nearly straight; the thighs large, and so close to each other as to leave only a small groove for the tail to rest on. These latter points often give a certain plainness to the horse. This description combines most of the best points peculiar to the heavy draught-horse, but they will seldom be found united in the same animal. The prevailing colour of the Clydesdale horse is black, but there are some browns and many greys. The market at Rutherglen and the Whit-Monday fair at Glasgow are the chief depots for them; and as these are attended by dealers from most parts of the north, young sound horses usually fetch from 40 shillings to 50 shillings, and not unfrequently still higher prices. They were sometimes used in gentlemen's carriages, but are not suited to the fashion of the present day. This breed has much improved since the middle of the last century, and might become still more so if a more careful selection of mares and stallions were uniformly made. "The Clydesdale breed takes its name from the valley of the Clyde in Lanarkshire; and is supposed to have originated by crossing the black horse [Shire] of the Low Countries with the native breeds. Clydesdales may be either black, brown, bay, or grey in colour, and usually stand about 16 hands, which is considerably less than the height of the black horse [Shire]. They are also longer in the body and less weighty, with a compact and muscular build, and a characteristic free and long stride." 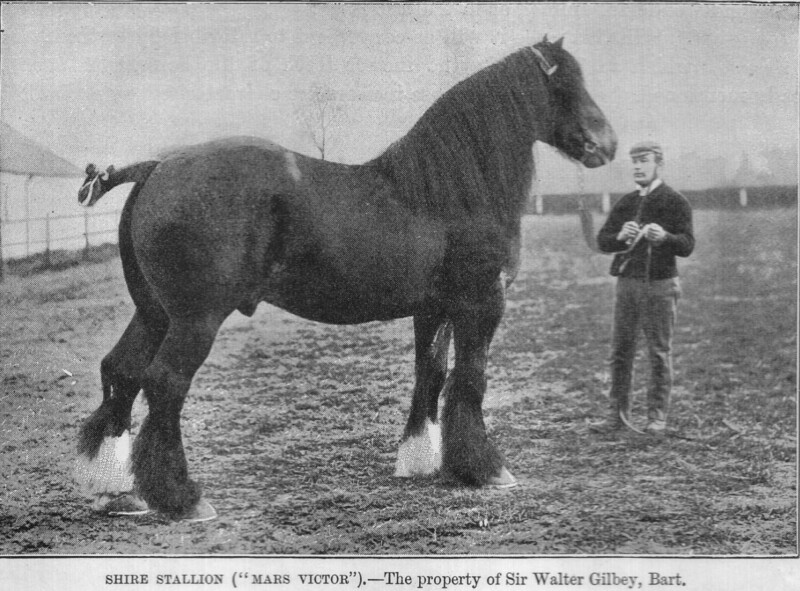 Sir Walter Gilbey described the Clydesdale in his 1910 book "Farm Stock 100 Years Ago": The Duke of Hamilton is credited with having imported Flanders stallions about 1600 or a few years later; the breed is said to have been produced by crossing these stallions with common Scotch cart-mares. The Clydesdale, a hundred years ago, was esteemed a good and useful farmers horse. Generally grey or brown, it stood from 15 hands to 16. The Clydesdale was popular in the northern counties of England, whither it had been brought from Scotland; but does not seem to have found its way further south, if we may base an opinion on the absence of reference to it by writers of the time. During the last fifty years great attention has been paid by breeders to the improvement of the Clydesdale. A Stud Book was established in 1883, and since that date the breed has been kept pure, and it now ranks as one of the best heavy breeds in the Kingdom. Large intakes of blood from Derbyshire had been made at earlier periods. Although horses of this type have existed in the La Perche region for centuries, the foundation of the modern Percheron was developed in the 1760s in north-west France using Flemish heavy horses and Arabians to create a clean-legged draft breed with heavy musculature, but lively action. Percherons are either black or grey in colour. It was introduced to Britain as a draft horse following the First World War. French horses (i.e. Percherons) arrived in the USA in the latter half of the 19th Century where they were crossed with Clydesdales for farm work. Many of the famed long-maned horses in circuses were either Percherons or one quarter Percheron/three quarter Clydesdale mixes. Percherons are suitable for riding as well as draft and were crossed to Thoroughbreds to produced hunters (and, nowadays, police horses). "Foreign Breeds: Among well-known Continental breed, the Percheron, represented on p. 501, while somewhat deficient in bulk and strength is remarkable for its energy and pluck. Belgium possesses two distinct original breeds known as the Ardennes breed, from the valley of the Meuse, and the Frisian, from the sea-coast. By crossing there has been produced the Brabancon horse, which although inferior in bulk and strength to the Clydesdale, has more breed and energy. Harnessed to heavy country carts, weighing about 3000 lbs, they will drag a load of from 6000 to 10,000 lbs on the level; and thus vastly exceed in power the original light Ardennes horse, which is fast disappearing." The bright bay horses from Cleveland, Yorkshire were renowned for all kinds of draft work, getting their alternative name of Chapman Horse because they were widely used by travelling salesmen (chapmen) to carry their wares around the countryside. 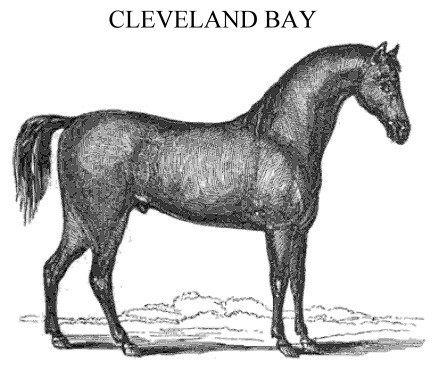 The original Cleveland Bay was a broad-backed agricultural/pack horse. During the 18th Century, the Cleveland Bay was crossed to Thoroughbred (Blood-Horse) stallions to produce larger, showier horses that would become popular carriage horses in the 19th Century. According to The Farmer’s Magazine in 1826, it was "neither Blood nor Black, that is, a distinct race from the English Blood-Horse, and equally distinct from the Black or Cart-Horse of the country" (a "blood-horse refers to a Thoroughbred). 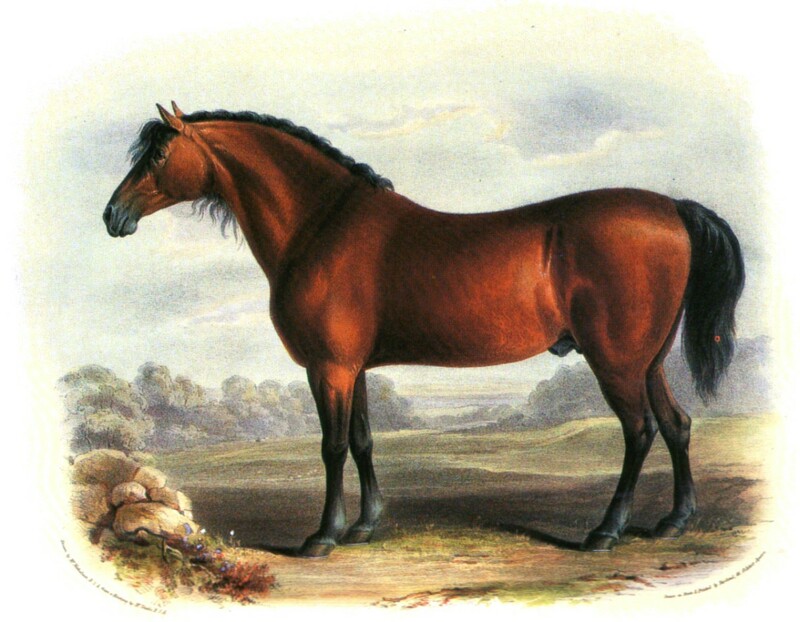 Cleveland Bay Stallion, 1840 by Shiels. This animal has fully shared in the progress of improvement, and is as different from what he was fifty years ago as it is possible to conceive. The clumsy-barrelled, cloddy-shouldered, round-legged, black family horse, neither a coach nor a dray-horse, but something between both, as fat as an ox, and, with all his pride and prancing at first starting, not equal to more than six miles an hour, and knocking-up with one hard day's work, is no more seen; and we have, instead of him, an animal as tall, deep-chested, rising in the withers, slanting in the shoulders, flat in the legs, with even more strength, and with treble the speed. […]There is a great deal of deception, however, even in the best of these improved coach-horses. They prance it nobly through the streets; and they have more work in them than the old clumsy, sluggish breed: but they have not the endurance that could be wished, - and a pair of poor post-horses would, at the end of the second day, beat them hollow. The knee-action, and high lifting of the feet in the carriage-horse is deemed an excellence, because it adds to the grandeur of his appearance; but, as has already been stated, it is necessarily accompanied by much wear and tear of the legs and feet, and this is very soon apparent. The principal points in the coach-horse are, substance well placed, a deep and well proportioned body, bone under the knee, and sound, open, tough feet. The origin of the better kind of coach-horse is the Cleveland Bay, confined principally to Yorkshire and Durham, with, perhaps, Lincolnshire on one side, and Northumberland on the other, but difficult to meet with pure in either county. The Cleveland mare is crossed by a three-fourth, or thoroughbred horse of sufficient substance and height, and the produce is the coach-horse most in repute, with his arched crest and high action. From the thoroughbred of sufficient height, but not of so much substance, we obtain the four-in-hand, and superior curricle-horse. […] The Cleveland horses have been known to carry more than seven hundred pounds sixty miles in twenty-four hours, and to perform this journey four times in a week; and mill-horses have carried nine hundred and ten pounds two or three miles. "In the present times, when railways have taken the place of the old mail coaches, the regular Coach Horse is little needed, and has been metamorphosed into the handsome but less-enduring Carriage Horse. A valuable Carriage Horse has a large admixture of good blood in him, and as he is required more for the sake of appearance than for steady, hard work, he is required to possess a high, strong action and proud bearing, well arched neck, and a light springy step. His speed is very considerable, and he can do a great amount of work, but he is not fitted for dragging heavy loads like his predecessors, nor can he endure a continuance of work, for several days in succession. The splendid action of the Carriage Horse, although it is very showy, and adds much to the magnificence of his appearance, is injurious to the welfare of his feet and legs, which are sadly damaged by being battered against the hard stones of the street pavements. 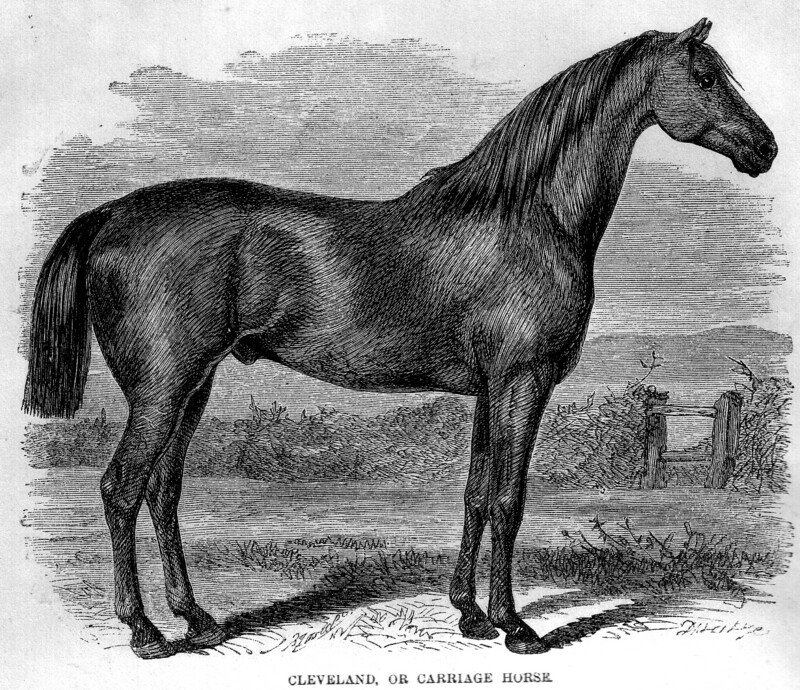 The name of Cleveland Horse is given to this animal because it derives its origin from the Cleveland Bay, a variety of the Horse that is largely bred at Cleveland, in the North Riding of Yorkshire, and which, when crossed with more or less thorough-bred animal produces the best Carriage Horses in the world. Very great care is bestowed on this important subject, and in the finest animals there is so much of the pure blood that, in the words of Mr. Youatt, "the Coach Horse is nothing more than a tall, strong, over-sized hunter." According to the same experienced author, the principal points in the Carriage horse are substance well placed, a deep and well-proportioned body, bone under the knee, and sound, open, tough feet. According to "The Complete Grazier And Farmer's And Cattle-Breeder's Assistant" By William Youatt and R S Burn (1864): The Cleveland Bay (fig. 25), delineated next page, is bred in various parts of Durham, Northumberland, and Yorkshire. The latter county, and especially the North Riding, has been long famed for its superiority in breeding horses of every description. The prevailing breed is that adapted for the saddle or for the coach; but, in the district of Cleveland, whence, as well as from their common colour, the breed immediately under consideration derives its name, and in the vale of Pickering, in the East Riding, they are taller and stouter than the others, more powerful, and better adapted for draught. They are, accordingly, much used in the North for agricultural purposes, and are there considered quicker in step, more handy, and in all respects more useful than the heavier carthorse of the South, while they are also believed to consume less food. They carry a fine coat, with black mane and tail, and although rather coarse-headed, they have a noble fore-hand, with a well-set shoulder and neck, a deep chest, and round barrel. Measuring from sixteen to seventeen hands in height, they have a stately appearance, and on this account were in much demand as coach-horses, while the heavy family carriages of former days were in vogue. Good hunters for heavy weights were also formerly bred from the mares when covered by thorough-bred stallions; but, since foxhounds have been trained to run with their present speed, and the barouche has been substituted for the coach, these have been condemned to the collar, and hunters are now only to be obtained from the second, or even the third, cross with the thorough-bred horse. The Cleveland Bay is better calculated for slow draught than for any other purpose. For rapid work, his carcase would be too heavy for his limbs, and he would be deficient in the elasticity requisite for quick action. When, however, he is not pressed, he will support a long continuance of fatigue, and has been known to travel the extraordinary distance of sixty or seventy miles within twenty-four hours, with heavy loads, three and even four times a week, besides being occasionally employed on the intermediate days (* See the Agricultural Survey of Durham, p. 257. f Mr. William Aiton.). There is, indeed, no better animal for farm labour; and the mares are the best species of stock for the double object of work and breeding. There is a mixed breed in other parts of Yorkshire, obtained by crosses with black and blood horses; but, for the general purposes of farming, they are not equal to the original stock. 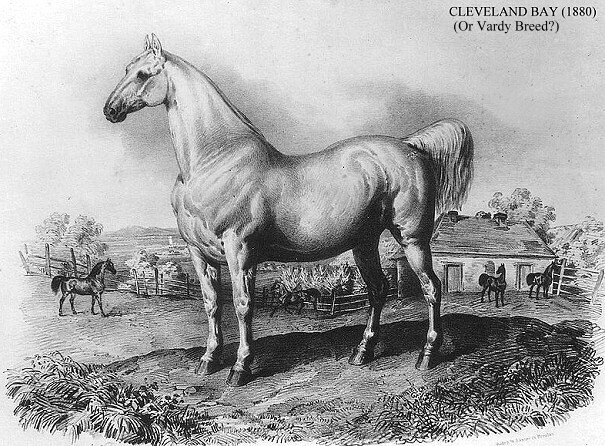 During the 19th Century, two distinct breeding lines arose: the Cleveland Bay (stud book founded 1884) and the Yorkshire Coach Horse (stud book founded 1886). 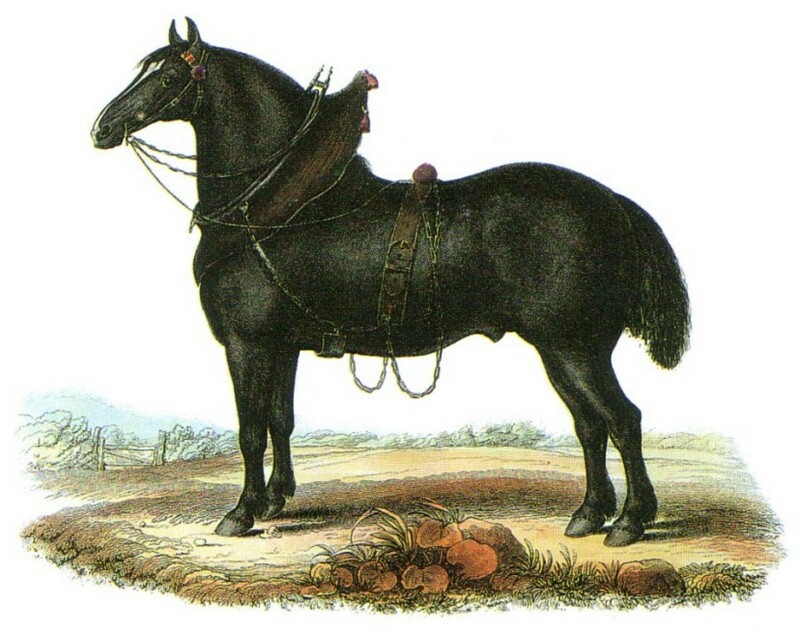 The Yorkshire Coach Horses were bred using purebred Cleveland Bay mares crossed to Cleveland Bay/Thoroughbred cross stallions. The latter is commemorated in pub names across Britain in the form of the Yorkshire Grey. The Yorkshire Coach Horse became extinct in 1937 and the Cleveland Bay also almost died out. "To the north of the Humber the native breeds of cart-horses are of smaller-bulk, and generally brown, or still lighter in colour; while they are altogether more active than the black horse. This lighter build appears to be largely due to an infusion of the blood of the higher races among the horses of these districts, which is not wanting even among those employed solely for heavy draught." Sir Walter Gilbey described the Cleveland Bay in his 1910 book "Farm Stock 100 Years Ago": The Cleveland Bay enjoyed a reputation for activity, strength and hardiness. Three of these horses, it was said, would draw one-and-a-half tons of coals sixty miles in twenty-four hours, without more rest than two or three baits on the road, and would frequently do this four times a week. Mr. Lumley Hodgson, of Highthorne, in Yorkshire, writing in 1889, says:- "The old-fashioned and, unhappily, virtually extinct Cleveland could ride, hunt, plough, and, to a short-legged Thoroughbred horse, breed the best of Hunters." A pure-bred Cleveland was usually, if not invariably, a bay with black legs. The process of " swamping" the breed with other blood had been going on for some time before our period. Marshall, writing in 1783, says that:- "The Vale, the Wolds, the Holderness (district) probably employ a hundred Thoroughbred stallions; one hundred mares are considered the full complement for one horse; some of them, perhaps, do not get fifty. . . . There must have been 10,000 brood-mares in use." This cross-breeding was done in order to produce coach-horses, also Hunters of greater size, heavy-weight Hunters being at this period in great request. In 1882, Mr. Thomas Parrington, writing to Lord Cathcart, said:- "It is much to be regretted that the foreigners have been buying them up for years, until it is now difficult to find such mares in the hands of farmers." Of recent years, since Mr. Parrington wrote, much has been done to restore the breed. Classes have been allotted to it at Agricultural Shows, and the encouragement given has produced the most satisfactory results. The late Mr. 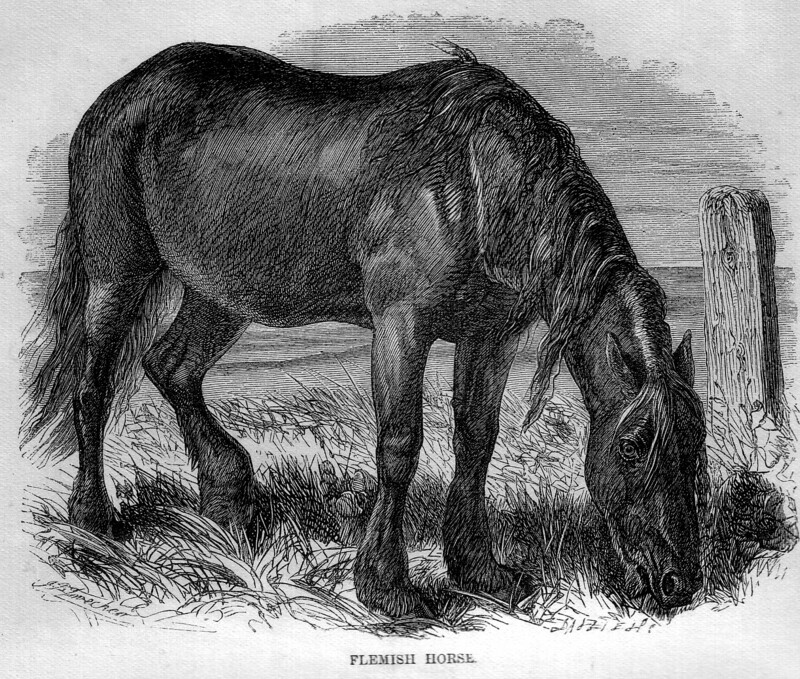 Blew (Journal of the Royal Agricultural Society of England, Vol 25, 1889) stated that, before the inauguration of the Cleveland Bay Horse Society's Stud Book, the foreign demand did much to keep the breed alive. Sir Walter Gilbey also described the Yorkshire Coach Horse in his 1910 "Farm Stock 100 Years Ago": In 1886 was established the Yorkshire Coach Horse Society. Classes are allotted to Yorkshire Coach Horses at many of the Shows, but it may be assumed that the breed is very closely allied to the Cleveland Bay. Cleveland Bay/Thoroughbred crosses recently have become popular for showjumping, eventing and coach-driving though in carriage driving classes, the native Cleveland Bay is sadly losing out to the imported Gelderlander. The "Vardy" or "Bakewell" breed was developed in north-east England using Cleveland Bay (Chapman Horse) and Shire horse types. The "Bakewell" breed name comes from its association with Bakewell’s Leicestershire Black Horses that gave rise to the Shire. It was a small cart horse measuring 16hh (1.6 metres) and was popular between 1830 and 1850 in Northumberland. However, it was too small for town use (for which Shires and Clydesdales were more popular) and was extinct by 1910. A small head seemed to be a distinctive feature of the breed. According to "Mason's World Dictionary of Livestock Breeds, Types and Varieties," the Vardy, from Northumbria was a draft horse similar to the Cleveland Bay, but heavier. It originated in the late 18th century from crossing the Shire, Cleveland Bay and Fell Pony and was extinct by 1910. It was also known as the Bakewell breed and the Northumberland Chapman Horse. In earlier editions, published when the horse was alive, this section merely referred to a draught gelding: "Among horses, I shall take the draught-horse, fig 435, and plate VII as the standard of comparison. This gelding is of grey colour, was bred by Mr Curry of Brandon, Northumberland, and is the property of Messrs Howey & Co, the great Carriers from Edinburgh into England. He is not a thorough-bred Clydesdale, having a dash of the coaching blood in him, a species of farm-horse much in use on the borders, and admired for their action and spirit." "The above figure represents the portrait of the grey gelding, bred by the late Mr Curry, of Brandon, Northumberland, and was the property of Messrs Howey & Co, the great Carriers from Edinburgh into England. This Gelding exhibits such a form as to constitute, in my estimation, the very perfection of what a farm horse should be. His head (A) is small, bone clean, eyes prominent, muzzle fine, and ears set upon the crown of the head. His neck rises with a fine crest from the trunk (B H to A), and tapers to the head, which is beautifully set on the neck, and seems to be borne by it with ease. His limbs taper gradually from the body, and are broad and flat, indicating strength; the hench is straight, broad, and strong, and the forearm (I) broad and flat; all excellent points in the leg of a draught horse, giving it strength and action. The back of the foreleg, from the fetlock joint (L) to the body (O), is straight, indicating no weakness in the limb – a failing here causing the knees to knuckle, and rendering the horse unsafe in going down hill. The hind legs (M), as well as the fore ones (K and L), stand directly under the body, forming firm supports under it. The body is beautifully symmetrical. The shoulder slopes backwards from (H) to (B), the withers at (B) being high and thin. The sloped position of the shoulder affords a proper seat for the collar, and provides the muscles of the shoulder blade (G) with a long lever to enable them to throw the fore legs easily forward, and with such a shoulder a horse cannot stumble. The back, from (B) to (C), is short, no longer than to give room for the saddle. The chest, from (B) to (O), is deep, giving capacity for the lungs to play in, and room for the muscles required in draught. The top of the quarter, from (C) to (D), is rounded; the flank from (C) to (N), deep; and the hind-quarters, from (F) to (E), long. On looking on the side profile of the entire animal, the body seems made up of two large quarters, joined together by a short thick middle, suggesting the idea of strength and action; and the limbs, neck and head, are so attached to the body as to appear light and graceful. In a well formed horse, I may remark, that the line from the fetlock-joint (L) to the elbow-joint (O), is equal to that from the joint (O) to the top of the withers (B). In a low-shouldered leggy horse, the line (L O) is much longer than the line (O B); but in the case of this horse, the body (B O) is rather deeper than the leg (L O) is long, realising the desideratum in a farm-horse of a thick middle and short legs. The line across the ribs from (G) to (F) is, like the back, short, and the ribs are round. He was 16 hands high, or 64 inches; measured from A to B 35 inches, from B to C 33 inches; from (C) to (D) 19 inches, being in extreme length 7 feet 3 inches. Length of the face, 25 inches; breadth of face across the eyes 10 inches; length of ears 6 and a half inches; breadth across the hook-bones 22 inches; girth behind the shoulder 80 inches; girth of fore-arm 23 inches; girth of bone below the fore-knee 9 and a half inches (the girth of this bone showing the strength of the fore-leg of every horse); girth of neck at the onset of the head 32 inches; girth of muzzle 21 inches; width of counter 19 inches; and height of top of quarter (C) from the ground 63 inches. In a draught horse the collar causes the muscles upon the shoulder to enlarge, and the neck to become thin. This horse’s name was "Fanner", his walk was stately, and he could draw 3 tons on level ground, including the weight of the wagon. He was a well known animal in Edinburgh for some years, and was generally admired. He was 11 years old when his portrait was taken in 1838." Despite Stephens’ praise for this variety, it was a short-lived breed due to its smaller size. LIVE STOCK. NEGLECTED BREEDS OF HORSES. SURVIVAL OF THE CLEVELAND BAY. Upon the subject of horse breeds in Great Britain that have been allowed to run out, a writer in the "Mark-Jane Express" offers the opinion that it is difficult to estimate the loss the country has sustained by the neglect of breeds of horses which at one time had become established in various parts of the kingdom. These breeds were established primarily because of the need of some such horse. For example, the Clydesdale, or Shire, was utterly unfitted for the work of the Devonshire pack horse or the Chapman horse, as the Cleveland Bay was originally called. On the rough roads, in many places, wheeled traffic was impossible, and the pack horse a necessity. When the utility of the older breeds was shown in other ways they were preserved and bred on more or less scientific lines till the types became thoroughly established. In these breeds there was a lot of horses admirably adapted for draught as well as for lighter work, and as a foundation for strong saddle horses they were invaluable. The breeds to which allusion may be more particularly directed, are the Cleveland Bay, the Devonshire pack horse, the Yorkshire coach horse, the old Holderness cart horse [a cross between a coach horse and the heavy black horse] and the Northumberland Vardy horse. The five breeds enumerated were good, and doing good, but for quite a perfunctory reason they became unfashionable. Then came the spirit of progress and so-called improvement, and whilst one set of breeders endeavored to improve them in another direction. Then those who bred one direction, another set was equally busy for utility only - that is, for the purposes of the farm. Seeing that certain breeds had, so to speak, lost their vogue, got rid of the old stock as quickly as possible and crossed with the heavy breeds till they had lost the former types. There are, however, still the Cleveland Bays and Yorkshire coach horses left, and here and there may be a Devonshire pack horse. But the Vardy and the Holderness cart horse have gone. These breeds are lost, and of the former very little is known by the present generation, and even in his native Northumberland he is now scarcely known by name. The books have nothing to say of his history, even that most accurate of historians, the late (Cadwallader J. Bates, never once mentions him in his history of Northumberland. What was the original home of the breed - whether it was localised in one corner of the county or spread over the whole of it, I have been unable to discover. That it was rapidly approaching extinction in the latter part of the eighteenth century may well be believed. The Vardy was a short-legged, active horse of the draught type. He was not a heavy horse, as heavy horses are known nowadays. His bone was very clean, flat and flinty in texture, very like the bone of the Cleveland Bay, and he had no feather in the modern sense of the word. He was under rather than over 16 hands, had fair action and shoulders good enough to carry a saddle. Indeed, when he was "trimmed up," he made a very good weight carrying hack, as he possessed good pace as well as stamina. A horse possessing such characteristics as the Vardy was by the very nature of things in a dangerous position. He could be got at from both sides. He could be crossed with the thoroughbred or the hackney to "improve" him in one direction; and with the heavier Clydesdale or Shire to improve him in the other. This is no doubt what took place, and in the process the original breed was lost. Sir Jacob Wilson remembered a few individuals of the breed that were, he said, fine horses for work. He looked upon their loss as serious, as they had hardy constitutions, had plenty of bone and substance, could carry weight and could get over the ground. There is a theory that they were descended from the horses which carried the Northumbrian men at arms on their raids. Sir Jacob Wilson said he had seen a horse that at any rate had a lot of Vardy blood in him. This was a horse named Silvertail. who travelled the Cleveland district in the [eighteen] sixties. He was bought at Newcastle fair without a pedigree, and was a good looking grey horse with the silver mane and tail from which he got his name. He was about 16 hands high, was a very fine mover, had good clean bone, and was a remarkably high-couraged horse. The owner had a couple of horses by him, and two better or harder horses he does not think he ever saw. They would have cut a poor figure in a show ring amongst the modern draught breeds, but when they were at their best, they would have made the best of these cut a sorry figure beside them when it came to work. As they could very cleverly manage 25 cwt. loads, or if it came to a pinch even a ton and a half, their powers of draught were sufficient for all practical purposes. In a plough they could work any of the heavier horses to a standstill. The younger horse was as good a harness horse as ever was yoked to a dog cart. This was found out by accident. One morning the owner had a train to catch, and the harness horse came out lame. The grey horse was handy, and put in the dog cart. He covered the four and a half miles to the station within twenty minutes without being touched with the whip. 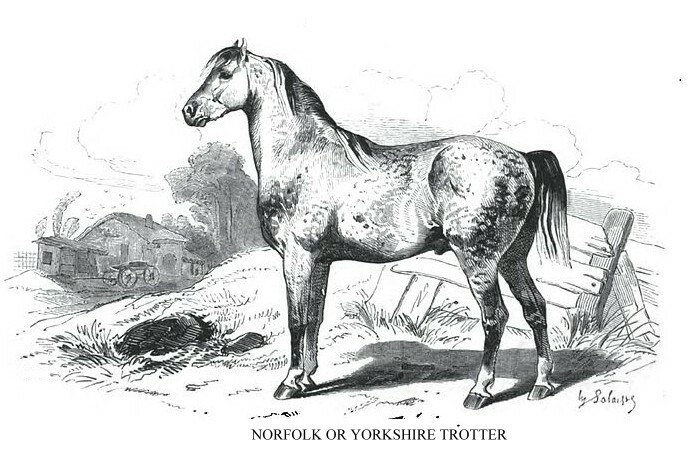 Another extinct draught-type breed, this was a large-sized trotting harness horse originating in and around Norfolk, but found throughout England. It was also known as the Yorkshire Trotter and as the Norfolk Roadster and Yorkshire Roadster. 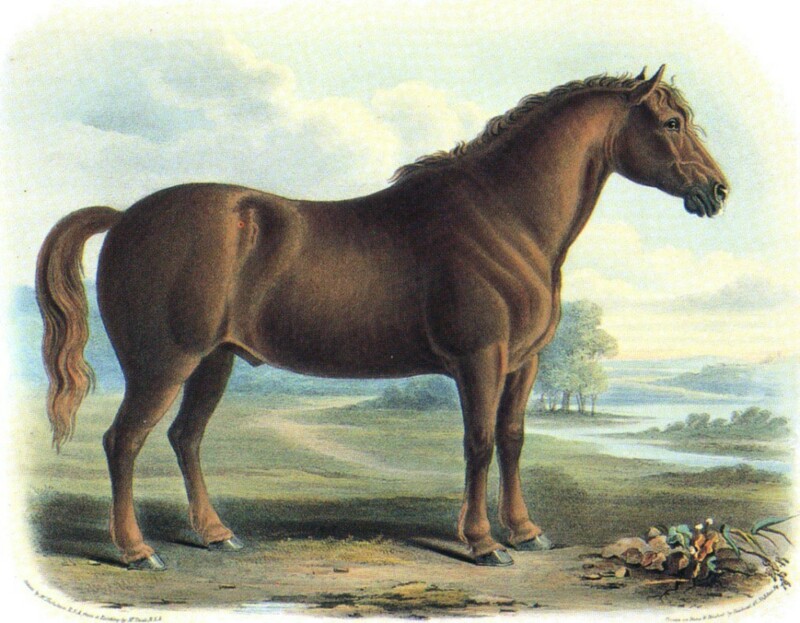 Though it is may have originated as far back as 1542, the most influential Norfolk Trotter sire was a stallion called "(Old) Shales" foaled 1755; Shales was sired by a Thoroughbred named Blaze (foaled 1733). Though essentially a saddle-horse, it had robust conformation and was able to carry a heavy man over long distances. It could also be used in harness as a light draught breed.